The Expert Advisor sends notifications to a mobile phone, via e-mail or activates an audio alarm in case any changes are detected on the trading account: opening/closing positions, changing order parameters, balance or leverage. Also, the Expert Advisor can inform that Equity on the trading account has dropped below a specified value or Free Margin is small compared to Margin. The Expert does not trade, it only monitors your account and orders. 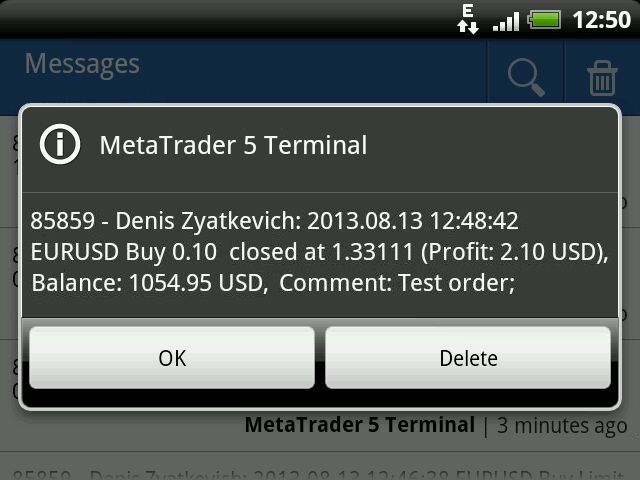 You should allow automated trading in your MetaTrader 5 terminal to let the operation of the Expert Advisor. To do that, enter Tools – Options – Expert Advisors tab and enable "Allow automated trading" parameter. To launch the Expert Advisor, right-click its name in the Navigator window and select "Attach to chart" or drag and drop it on the chart by mouse. The windows of the Expert Advisor's parameters will appear. Set the desired parameters and click OK. The Expert Advisor can be attached to the chart of any financial instrument on any time frame. Screen Information - show/hide information about the conditions of notifications activation (Show, Hide). First of all, you should have mobile version of MetaTrader 4 or MetaTrader 5 terminal installed on your Android or iOS powered device to receive notifications. You can download MetaTrader 4 or MetaTrader 5 mobile terminal for Android, as well as MetaTrader 4 or MetaTrader 5 mobile terminal for iOS for free. You should also allow sending push notifications in MetaTrader 5 trading terminal, on which NotifyMe for MT5 is to be launched. To do this, enter Tools – Options – Notifications tab, turn "Enable Push Notifications" parameter on and specify MetaQuotes_ID that can be found on Messages tab of the mobile terminal. "Enable Push Notifications" parameter allows you to enable or disable sending notifications to the mobile terminal. When it is set to "Only Open/Close position notifications", notifications are sent when opening and closing positions. If "No notifications" is selected, notifications are not sent to the mobile terminal. "Push Notification Interval" input parameter allows you to set the minimum time interval (in seconds) between notifications sent to the mobile terminal. The Expert Advisor will not send a new notification if less than specified time has passed since sending the previous one. It will save that notification instead. When the time specified in "Push Notification Interval" parameter passes since sending the previous notification, the Expert Advisor will send a message containing descriptions of all events accumulated by that time. There is a limitation (of push notifications service developed by MetaQuotes) on the number of sent messages per unit time: no more than two messages per second and no more than 10 messages per minute (if this limitation is violated, sending push notifications can be blocked by MetaQuotes). Therefore, it is not recommended to set very small values (especially in case of the events' high frequency on a trading account). "Push Message Maximum Length" parameter allows you to set the maximum number of symbols in a message sent to the mobile terminal. If a message is longer, it is truncated down to the length specified in the parameter. The maximum permissible length of a push message is 255 characters. A message consists of two parts: account number with account owner's name (generated automatically) and a text description of an event generated by an Expert Advisor (its length is limited by "Push Message Maximum Length" parameter). In some cases, a message may become invisible in the mobile terminal if its length exceeds 255 characters. "Push Message Maximum Length" parameter value should be selected based on the length of the automatically added part of the message (account number and owner's name). To receive notifications via e-mail, you should allow sending emails in the settings of MetaTrader 5 trading terminal, at which NotifyMe for MT5 is launched. To do this, enter Tools – Options – Email tab, turn Enable parameter on and specify your e-mail account and SMTP e-mail server parameters. Messages sent by the Expert Advisor via e-mail have subject "Account account_number notification". "Enable Mail Notification" parameter allows you to enable or disable sending notifications via e-mail (similar to "Enable Push Notification" parameter for sending push notifications to your mobile phone). "Mail Notification Interval" input parameter allows you to set the minimum time interval (in seconds) between notifications sent via e-mail. The Expert Advisor will not send a new notification if less than specified time has passed since sending the previous one. It will save that notification instead. When the time specified in "Mail Notification Interval" parameter passes since sending the previous notification, the Expert Advisor will send an email containing descriptions of all events accumulated by that time. Some e-mail servers perceive frequent emails as harmful actions. Therefore, it is not recommended to set too small values for "Mail Notification Interval" parameter. "Enable Sound Notification" parameter allows you to enable or disable audio alarm notifications (similar to "Enable Push Notification" parameter for push notifications sent to your mobile phone and "Enable Mail Notification" parameter for e-mail notifications). "Sound Notification Interval" input parameter allows you to set the minimum time interval (in seconds) between audio alarm notifications. "Sound File Name" allows you to set the name of an audio file to be activated when a notification arrives. A file in .wav format should be located in terminal_folder/sounds or its subdirectory. "Screen information" parameter allows you to define if server and local time, as well as the settings for each notification type will be displayed in the upper left corner of the chart. Reversing position: 2013.08.13 01:53:36 EURUSD Buy 0.10 -> Sell 0.10, Op:1.32918, SL: 0.00000, TP: 0.00000. There is a full version of the program - NotifyMe for MT5. It can send notifications of placing and removing pending orders, changing order and position parameters, altering balance or leverage size, as well as Equity and Free Margin dropping down to a critical value specified in the parameters. Also, full and free versions of NotifyMe application with similar features are available for MetaTrader 4 trading terminal. The developer of NotifyMe for MT5 is not responsible for possible modification or termination of the program's operation due to changes in MQL5 language implemented by the trading terminal and language developer - MetaQuotes company. The developer of NotifyMe for MT5 is not responsible for any loss, damage or missed profits caused by the use of the program, its work or malfunction. If you have any questions about the product, comments on its operation or suggestions for future improvements, please send them by email or leave your personal messages via this web site. Let me know what products (Expert Advisors, indicators, scripts) you would like to see.